Researchers have developed a climbing robot that has dry but sticky gecko-like feet and can crawl around an orbiting spacecraft to maintain and repair it. With the invention of the new robot, astronauts won't have to risk their lives in daring spacewalks to fix things like they did last month on the International Space Station to repair a cooling system. Instead, they could just command swarms of crawling automatons to do the job, 'New Scientist' reported. The gecko robot, called Abigaille III, has been developed by Michael Henrey and his colleagues at Simon Fraser University in Burnaby, Canada. To test Abigaille's space flight credentials, Henrey took it to the European Space Agency's labs in Noordwijk, the Netherlands, where it was put through its paces at the extreme temperatures and zero-pressure conditions of space. The team developed techniques similar to those used in the microelectronics industry to create "footpad terminators" much like the nanoscopic hair on a gecko's feet. A gecko's feet are sticky due to a bunch of little hairs with ends just 100-200 nanometres across -- around the scale of individual bacteria. This is sufficiently tiny that atomic interactions between the ends of the hairs and the surface come into play. 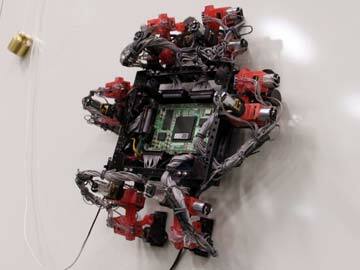 The robot features six legs, each with four degrees of freedom for optimum agility, allowing the robot to crawl from vertical to horizontal to get around obstacles. "Our Abigaille climbing robot is therefore quite dexterous, with six legs each having four degrees of freedom, so it should be able to handle environments that a wheeled robot could not," said ESA's Laurent Pambaguian. "For example, it can transition from the vertical to horizontal, which might be useful for going around a satellite or overcoming obstacles on the way," Pambaguian said.